Uninterventionist wine means you don't do anything and just wait, and Andrea Calek isn't shy of saying he is lazy, that's why the wines are good. The good thing with him is that you won't have the expected narrative, there's always something off what has become the beaten path of natural-wine discourse. He doesn't care what people think and just do things as they come, with resulting wines being splendid year after year. The guy is elusive to square systemization, and we know that even in the rebel nature movement we tend to substitute an old (conventional) formatting by a new (natural) formatting, especially in the narrative. None of that with Andrea, don't expect the usual answers or you'll feel off balance. We found the facility among the vineyards, along a small road between the villages of Valvignères and Alba-la-Romaine, I was looking for an old Citroën CX to spot the domaine, remembering that he kept at least one of them on the grounds. The facility is like Andrea, it's not orderly brushed and polished, there's stuff sitting here and there under the sun, if you're looking for a post-card view of an artisan domaine that's not the right pick. The new building (2010) is still unfinished in the inside (but on its way as I understand) and we sit in the unglamorous view of insulated panels when we join the few people who were there with Andrea, happening to be mostly Yvon Métras' family, ex-wife and daughter Agnès (pictured). Agnès is living in the area for a while, working at the much-acclaimed restaurant La Tour Cassée in Valvignères (with an exciting wine list you can guess). __ A Toi Nous 2015, Vin de France (table wine), the 2nd edition of this cuvée. 70 % Syrah, the rest is Grenache, 30 % to 40 % of direct press. The first vintage of this cuvée (2014) was a tiny, 1000-bottle batch and the 2nd (2015) was much bigger with 12 to 14 000 bottles, he made two different bottlings. This is a primeur wine, with a first bottling in december for this vintage (2015), the 2nd bottling was june 2016. He uses the vineyards that yield grapes that are the lowest in alcohol, it's not necessarily the youngest vines, some may be old as well. Super easy to drink, a pleasure with fruit and velvet. Unfiltered and no added so2 like all of his wines. Not a carbonic maceration, he stopped doing carbonic macerations in 2014, this cuvée is made with whole-clustered grapes which macerate for a while, after which girls climb over the fermenter and dance on the grapes for the foot stomping. Of course part of the batch gets a carbonic maceration as the fermenters are big and the girls are light, he says with a grin. This bottle sells for 8 € tax included, very good value indeed. Andrea still lives in a trailer (like he's been doing for years) because the house next to the facility isn't finished yet, but the view on the hills and vineyards will be gorgeous as you can check. You can see here a couple other Citroën CX models, he got the one on the front around here, it's a unique model with a regrigerated room for cheese transportation. There's other one in addition to the white ambulance pictured on top, it's a grey station wagon which would make a perfect car for spartan camping or sleeping in the car. Some of them are in running condition or ca be fixed, but I think the ambulance is beyond repair, it'll stay there as a de-facto emblem of the place. Also, I think it's easier to have locals give you directions for "the winery with a white CX Citroën at the door" than spell them a strange name they may have never heard. Andrea's vineyards are all around the facility, except the whites that are near Gerald Oustric's Le Mazel. He has 5,5 hectares in reds here around this building and he buys the grapes from Gerald for a surface of 2 or 3 hectares for the white. He does the harvest himself (with his own team) for the purchased grapes. His whites (Viognier, Chardonnay) which also get no sulfites at all are vinified in casks only, with a 2-year élevage, the fermentation often takes a long time (the first time in 2007 it took 4 years...). Oddly his reds always finish to ferment before spring but the whites need longer, and because the white makes 13,5 % or 14 % with a low acidity, that may be better this way, he says. The whites from 2014 and 2015 for example are still in the casks (30 of them in all) and have yet to complete their fermentation. Once bottled, the white is sold out in 2 months meaning he has none to sell right now (the 2013 is sold out since december 2015). But the whites make 4000 bottles on a total production of 40 000, it's marginal for the volume. This year he'll certainly rack the 2014 to make room for his 2016 white. His total volume reached 40 000 bottles as soon as he got the vineyards around here in 2012 and he's making this volume year after year, even if 2016 will be smaller because of the weather conditions. __ Babiole, vin de France (table wine) 2013, 60 % Grenache and the rest in Syrah. Longer maceration than for A Toi Nous. Costs 9 € tax included, a treat for this price, not to miss if you have a chance. Nose : such a fruit, intense, suave. In the mouth, the whole thing is underlined with a vibrant acidity feel. The back label tell the 2 important dates : the harvest (2013) and the bottling (april 10 2014). He can't put the vintage year upfront or he has to ask and go through the administrative process. If the wine was in the AOC it'd be a Vin de Pays which isn't worth the pain, so like all the artisan vintners around he goes for the easiest table wine (Vin de France) label. That's indeed again to taste such beautiful things under the bland table-wine labelling, but we're used to that. The vineyards are all around here, it's an advantage to work but a risk when there's a hail storm. Asked if he has relations with the vintners and vignerons in the Czech republic, Andrea says yes, with a few of them, he even has a friend there who makes 3 million bottles, not really an artisan domaine even if he makes experimental wine without added sulfites. He is also an Associate Professor and was taught by the highest expert on the matter, Professor Kraus, who died a couple years ago and who did a lot to promote and improve viticulture under the socialist regime. Andrea says he's going there now and then since 1999, he also sells François-Frères barrels over there in the Czech republic, it's kind of a side job for him, and that's a way to meet winemakers and feel the pulse. By the way there's a new wine fair in june (2017 will be the 3rd edition) named Prague drinks Wine where you can sample the last wines from the country. Andrea says that he even did some vinification in the country (in Moravia) in 2004 after he finished his mission at Domaine Hauvette, this was for Domaine Springer (now Stapleton & Springer), I understand he helped for the 1st vintage there, making for example for the 1st time a wine with only indigenous yeast and no added sulfites anywhere during the vinification. He succeeded to convince them to let him conduct such a batch, otherwise the wine culture in the Czech republic is very German and Austrian in style, meaning they're very conventional and square, following the technical sheet all along including for the SO2 additions. Now, he says, there are more artisan vignerons doing natural wine in his home country (Bohemia & Moravia) than in the whole of Germany even though the vineyard surface is so much smaller. Andrea has been invited to this new wine fair but he hasn't the time anymore to travel there, hasn't been back for 4 years actually, but he still sells barrels there. Asked whom he socializes with in the group of artisan vintners in the area, he says of course Gérald [Oustric] but also all the others because they have a CUMA together [a CUMA is a French system for shared ownership of agricultural or winery tools], they have a bottling line, a mini excavator, a lab, things like that. These guys are Christophe Comte, Gérald Oustric, Gilles Azzoni & son, Méryl Croizier, Jérome Jouret, les Deux Terres, Sylvain Bock, Gregory Guillaume, the Ozil brothers, Laurent Fell, this makes quite a large group indeed, all sharing the same philosophy and based in this corner of Ardèche. This is actually a variable-geometry CUMA, meaning that some registered for this or that tool, depending of their peculiar needs. The domaine has a small range of cuvée every year, on average 4 reds and one white.I ask about the yields in general, Andrea says he hasn't figures to differentiate the individual cuvées on this issue but since 2012 the yields on average are from 45 to 50 hectoliters/hectare for the whole of the domaine. __ Penultième vin de France 2014, a red made with Merlot 85 %, the rest in Viognier. He grafted the Viognier over existing Merlot vines in order to get the vines he needed. With their group they had this training on overgrafting, this helps getting a productive vine with the new variety starting the following season, it's very convenient. They tried 2 grafting techniques, which he explained to us in detail. It's an easy way to changed variety in a parcel you just bought if it's not the one you wished, the only thing is that the original vines have to be 20 to 30, not older if you want the best results. There isn't much Merlot otherwise around here, it was brought here in the past because the coop growers liked the fact that even with the high yields they trained it for, it had high potential alcohol (and they were paid along both the volume and potential alcohol). These Merlot are about 20, a bit older. The chew is very nice and fresh, so fresh, this is something you like to find in a Rhone wine. Typically, Andrea says that the wine tastes beautiful in the barrels stage, then needs 3 or 4 months to recover from the bottling but it eventually lands on its feet after a while. He does the bottling with the shared bottling line but he doesn't switch the pump on, it's done thus by gravity from a 4 meter height, and for the bottom of the vat he lifts it a bit with the forklift. This bottle sells for 21 €, anotyher bottle not to miss, if more pricey. Andrea says that in 2016 his parcels of red suffered from hail earlier in the season, especially for the vines trained in goblet vines, it's the first time he gets such a blow on his vineyard with hail. He has till to assess the extent of damage and see what grew through the destruction, but there's a good chance he'll not make Babiole in 2016 because of that (there's a majority of Grenache and these goblet parcels have been hit hard). There'll be less of Chatons and of Pénultième also, he'll see that. Speaking of the vineyard sprays he uses sulfur and copper, there have been some years when they could tone down the copper but lately black rot has appearedin the area and they'll need copper for sure. Last year they had a big push of this disease and initially he sprayed very little but he ended up spraying more than his colleagues because he missed the preventive step. This year he had no occurence but he sprayed preventively. I ask about the table-wine labelling, if he got that from the start, he says when he started to get the "Vin de Pays des Coteaux de l'Ardèche" appellation, which was the minor AOC status attached to this particular corner of Ardèche, but for his Primeur 2007 he was told by the appellation people that they'd not even taste the sample because the lab analysis for his wine pointed to 10,5 % alcohol which was too low (the minimum "allowed" was 11 %), so he put the wine under a table-wine label and did the same for the following cuvées. He says most vignerons around here are growers selling to the coop, they're the one who taste for the agreement and as artisan wines are ready much later than their own they know even in these administrative blind tastings which type of wines they're dealing with. They're not used to these wines and frankly don't favor them, and it doesn't really bother the wine authorities if people like him have to bottle as table wine. I asked Andrea what he learnt actually in the wine school and the Lycée Agricole, it's in part doing the lab analysis as I suggest, but foremost management things, how you run a farm and a business. He leaned things on the viticulture in the ESA wing of the school, in Angers, the enology part was taught at the Université du Vin in Suze-le-Rousse (southern Rhone) by Marcel Richaud's sister, the marketing/management part being taught in ISARA Lyon. Of course he didn't need the marketing stuff but the management part of the curriculum was important, how to differentiate the different tax- and legal format for your agricultural business. Asked about the subsidies given by the French state to start a farm or other later subsidies, Andrea says he's not interested in general, he says they're nefarious. He actually got one from Agrimer (the Ministry of Agriculture) to build the cellar, but didn't take the 40 000 € he was entitled to for the building of the warehouse, same for the vineyard part. He says for his size and style of domaine subsidies aren't worth, that's different of course for a business like Chapouutier, they have full-time office people who weigh the feasibility of such or such government help and secure the legal basis for this public financing. You need to be very careful because the agriculture-subsidy rules keep changing and if you haven't the backing of trained lawyers to be at the receiving end of these subsidies you may be forced to pay back and fined 5 years after being helped, all that for a fine-print paragraph in the rules you didn't catch. It's definitely a big-farm thing. We toured briefly the facility, that's a new building of course, without the charm of old historic structures. The only refrigerated room is the one where Andrea keeps his pallets of wine waiting for sale and shipping. The vat room at the street level has a few resin/fiber vats with floating lids. It's naturally cool because it's half in the foothill but there's no air conditioning here either. The cellar had no functioning light and I could take a snap with Andrea holding his flashlight. The walls were painted in black, it's not the fungi. It's more comfortable to work here he says, in his former place he had to move the wines outside the building in june because it was too hot. Andrea Calek wines are exported to many countries, to the United States (Savio Soares Selections), Japan (Oenoconexion, Mr Ito), Australia (Host Wine Imports), Canada (Quebec : Martin Juneau - Vancouver VinoVancouver), South Korea, Sweden (Vin & Natur), Norway (Nondos), Finland, Holland, Belgium. Enjoyable piece. I will have to try Calek's wines again, since the one time I had a bottle here in the US, I was a little disappointed, since I had read so much about him. I'm pretty familiar with that area, since we've spent a couple of weeks there on 2 occasions. One producer we got to know quite well is Jerome Mazel/Domaine Jerome Mazel in Pradons, whom I wish would get more press, and a US importer. He makes outstanding wines, and when I wrote about him 6 years ago (http://mainelywinenews.blogspot.com/2010/04/domaine-mazel-jerome-mazel-master.html), I thought he'd develop more of a following. By the way, I looked back at my pictures of Valvigneres from our most recent visit, and I saw several with La Tour Cassee in it. I didn't realize at the time that it was such a well-respected restaurant. Thanks for posting this. 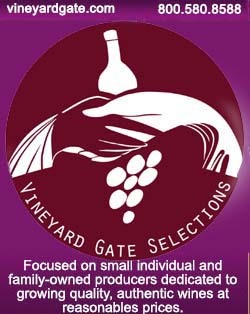 We are going to track down an bottle and review it on www.californiawineryadvisor.com. We love introducing wines from outside the US to our readers.